Over the years there have been a number of tattoo clubs around the world. Many are organized around a country, such as the Tattoo Club of Japan. Some incorporate more than one country, as the European Tattoo Artist Association. Some clubs establish themselves around a city such as the Sandusky Tattoo Club, while still others try to bring in people from around the world such as the International Tattoo Club (ITC). All of these clubs encourage their members to have their logos tattooed on themselves. For the ITC, is was a stylized cobra snake design. 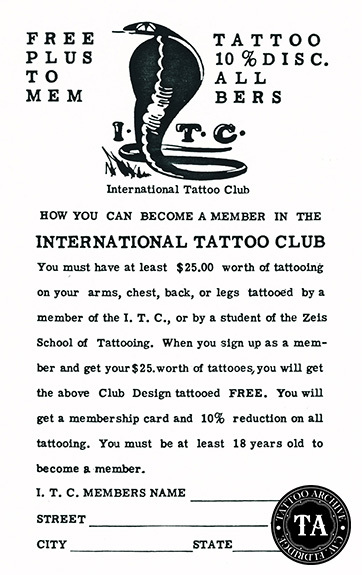 Founded by Milton Zeis in the 1950s, the ITC was promoted through Zeis' supply business, the Zeis Studio. 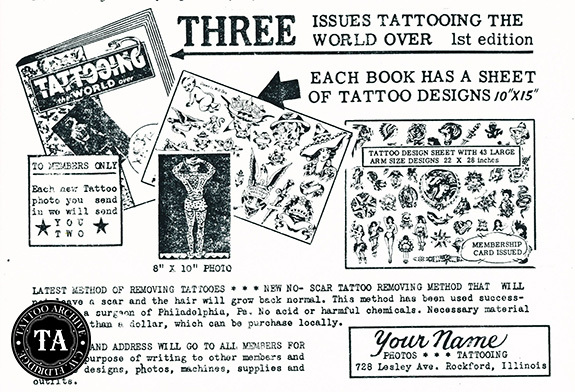 During this period there were several tattoo clubs formed around the world and many of them were probably inspired by Les Skuse's Bristol Tattoo Club. Skuse, and his club got a lot of press in the English and international newspapers, so folks around the world read about his club and though it was a good idea. 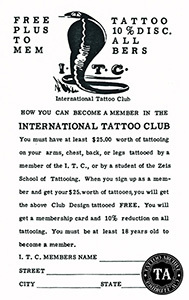 When the ITC was first formed the yearly dues were $12.00 which included three issues of Tattooing Around The World, a 22 x 28 "pork chop" sheet of flash, one 8 x 10 photo of a tattooed person and information on the latest "No Scar" method of tattoo removal. Each month, for twelve months, members would also receive a new 8 x 10 photo of a tattooed person and one 8-1/2 x 11 sheet of the best selling tattoo designs. Not a bad deal for your $12.00 investment! The first issue of the ITC newsletter, listed members such as Ralph Johnstone, J.C. Johnson, Danny Styron, J.A. Howard, William Jones, A.F. Eddy, Karl Bumpus and Robert Smiley. In was in that newsletter that the death of Charlie Wagner on January 1, 1953 and of Percy Waters in December, 1952 was announced. Zeis also reported that Tex Howard had gotten all of Percy Waters' personal collection of tattoo negatives and was going to make them available to the public.